You will be met pier side for a short ride to the heliport where you will be briefed on your upcoming adventure. 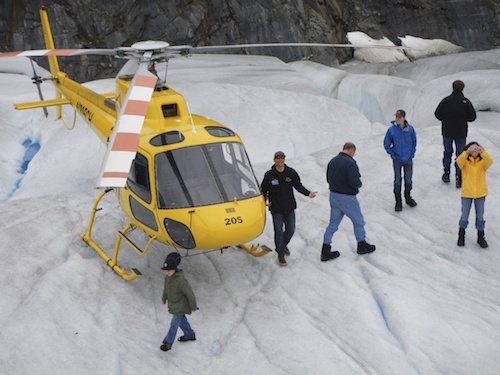 Experience an unparalleled sensation as you lift off and fly up and over the Mendenhall Glacier, spectacular icefalls and through mountain passes only accessible by helicopter. 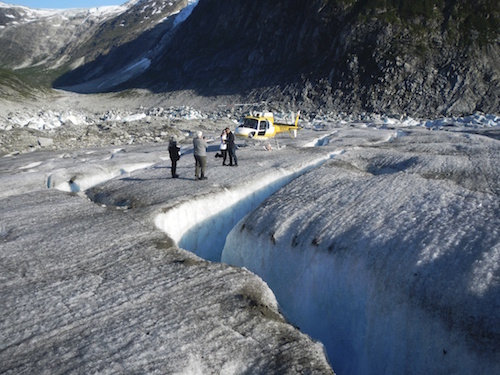 View the glaciers and fields that make up the Juneau Icecap and as a highlight, you will actually land on Herbert Glacier where you will disembark and set foot on this "river of ice". Bring your camera; this is a once in a lifetime tour! Your pilot/guide will point out the various formations and answer your questions. Your adventure of a lifetime will conclude as you fly back to the heliport and are driven back to downtown. Due to weight and space limitations for the helicopter, there is a supplemental charge for persons weighing 280 lbs or more. You will need to book the "280lb+ Adult" ticket if you weigh over 280lbs. As you are weighed prior to flight, please be advised that if the supplemental fee has not been paid in advance, it will be charged prior to boarding. Depending on availability of seats you may be denied boarding and no refund will be issued. There is a no bag policy for the helicopter, it is a safety issue and an extension of an FAA policy regarding unsecured baggage in the aircraft. All items taken on board must be in pockets or in something like a waist pack, no backpacks, purses, bags, camera bags. Bins are available where you can leave a bag(s) during your tour. The tour facility is staffed at all times for security, however the bins are not locking. About 25 minutes is spent on the glacier. Due to weight and space limitations for the helicopter, there is a supplemental fee for persons weighing 280 lbs. or more. As you are weighed prior to flight, please be advised that if the supplemental fee has not been paid in advance, the supplemental fee will be charged prior to boarding. Depending on availability of seats, you may be denied boarding and no refund will be issued. The weight restriction is 280 pounds (clothed weight, including cameras, shoes, coat, etc.). Passengers 280 pounds or more will be need to book the "280lb+ Adult" ticket. PLEASE NOTE: There is a no bag policy for the helicopter, it is a safety issue and an extension of an FAA policy regarding unsecured baggage in the aircraft. All items taken on board must be in pockets or in something like a waist pack, no backpacks, purses, bags, camera bags. Bins are available where you can leave a bag(s) during your tour. The tour facility is staffed at all times for security, however the bins are not locking.